A slightly strange anomaly exists as a neighbour to Spain. This large, jutting rock is part of the British territories. It is Gibraltar. It isn’t, perhaps, the first place that comes to mind for a short break or day trip. However, it has more than 1,500 years of Moorish, Spanish, and British history. So why not? The country holds its own in terms of luring visitors from southern Spain. It’s a major tourist attraction on its own. It also has an international airport, military base, and is home to approximately 30,000 residents. On top of that, it holds some of the most extensive military fortifications in the world. Here’s why you should pass a day or two in the 6.8 square km that make up the country. It’s the most southern point of the Iberian Peninsula. You’re so close to Morocco you can almost smell the cumin. However, cars are driven on the left. All the signs are in English. There are even British shops! It’s strange for Brits to cross from Spain, where everything is so different, into a country where everything is all quite familiar. When it comes to food, you’ll find local twists on popular staples–it’s rather like visiting an overseas version of Britain with much better weather! 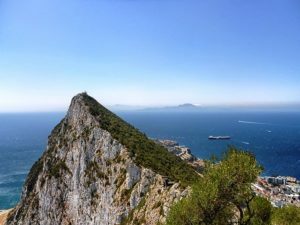 In Moorish times, the great Rock of Gibraltar was called one of Pillars of Hercules. To this day, you can absolutely see why. 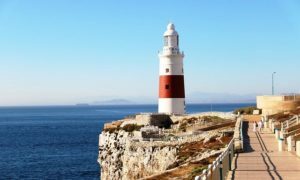 Explore Gibraltar’s mainland mass from above and underground. Within this enormous jutting rock of Jurassic limestone are some of the best caves in Europe. From the top of it are easily the best views of North Africa. You can get to the upper part of the rock by taxi or walking. However, definitely the most fun way is by cable car from the centre of town. The upper rock is a nature reserve and bird watchers know it well. However, the birds aren’t the main attraction. Gibraltar’s main tourist pull is the semi-wild apes that call the rock home. These apes are omnipresent while you walk around. When it comes to views, the east side of Gibraltar offers some of the most breathtaking. That’s not all the wildlife Gibraltar has to offer though; the Bay of Gibraltar has some of the best places to go dolphin watching. There are bargains to be had with Gibraltar’s tax-free shopping, particularly when it comes to alcohol and cigarettes. There are also the familiar high street names such as Marks & Spencer, Next, and Topshop. From clothing to accessories, Main Street caters for all tastes and budgets. If designer brands with 20% off sounds attractive to you, then you’ll love having a leisurely day of shopping. In 1704, an Anglo-Dutch force captured Gibraltar and thus, under the Treaty of Utrecht, Gibraltar was given to Britain. It has been an important military base ever since. For military history buffs, there is enough interest for at least a day trip. Most of the historical sites are to the south of the city. The museum has a detailed history, artifacts and Neanderthal man remains within the city walls. You’ll also find a Moorish castle with some of the oldest remains in the city on the south side.